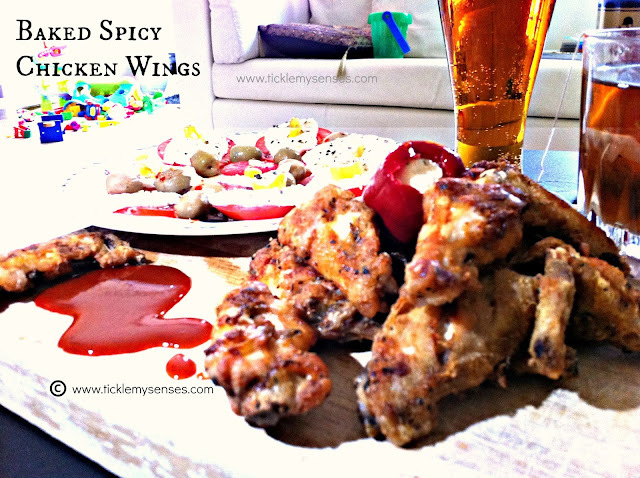 Tickle My Senses: Baked Buffalo Chicken Wings/ Baked Spicy Chicken Wings! Baked Buffalo Chicken Wings/ Baked Spicy Chicken Wings! If you are a Wings lover, I am about to change your life. I am about to make you the happiest person on the planet. I am about to tell you how to make a very tasty hot and spicy chicken wings dish, better known as Buffalo Chicken wings!!. The original Buffalo Chicken Wings is deep-fried wings coated in a sauce of vinegar-based cayenne pepper hot sauce and butter. This is a baked version of the original deep fried version hence a healthier choice. These wings are a perfect accompaniment to drinks and is a hit at my parties. I first tasted these wings on our trip to the US in 2012, and the love was instant. A wonderful explosion of taste and flavours, the hot chilli from the sauce with the crispy skin of wings and juicy meat, absolutely delightful. Had to make it at home. Picked up a bottle of Buffalo wings sauce on our way back and created it in our kitchen using a very popular recipe from here. The result was delightful. SPICY, CRUNCHY and GONE in minutes!! For a kids version reduce the spice in the coating flour and serve along with a sweet BBQ sauce or Ketchup. It is important to remember 2 things while making these wings 1. to dry the wings thoroughly before coating with the flour 2. place the wings in the fridge for atleast 50 mins to an hour. Both these steps will give you a crispy chicken skin, then bake in an oven for an hour or so till golden brown and done. Pour over the wings sauce or serve in a bowl along side. 1. Cut wings at joints. 2. Wash wings and thoroughly dry them using paper towels. The drier the wings the crispier they will turn out. 3. Line a baking sheet or roasting pan with parchment paper/foil, and place a cooling rack or equivalent on top of the lined roasting pan. The coated wings will be placed on top of this rack while baking in the oven. This will stop the wings from soaking up all the fat that drips down from the wings as it is cooking. Lining the roasting tin will allow all that grease to be easily cleaned up. 4. Combine flour, cayenne pepper, garlic powder, black pepper and salt in a bowl. Add any other dried spices of your choice to the flour. 5. Dredge the prepared wings into the flour mixture . Place the dredged wings on the prepared rack and place the entire set up in the lowest shelf of your fridge for 45 min-1 hr uncovered. This will allow the coating to set and create a wonderfully crispy coating. 6. Preheat oven to 200 C or 400F for 7 minutes. 7. Take out the wings from the fridge and in the center of a hot oven. Bake at 200C for 30 minutes. Then turn over and cook for another 25-30 minutes until the flour coating appears nice and crispy and the wings are cooked. Take out of the oven and rest for 5 minutes. Place the wings in a serving bowl. 8. In another bowl whisk together your favourite wing sauce along with the melted butter or oil. Either pour the sauce over the rested wings and toss to coat well or simply serve in a bowl alongside the wings . If you enjoyed this recipe, you must get your teeth into my much loved Chilli Wings Recipe or Wings on Fire. You will love its simplicity and flavours. Savoury Hot Egg Puffs using Mangalorean Spices! Mangalore Style Crab Pepper Fry. Fusili pasta with Red peppers and Boiled Eggs.